I’m honored to welcome you to Broadview. As Mayor, I’m committed to working cooperatively with the pillars of our community: our library, our park district, our schools and our local businesses. Together, we’re building a vibrant village that is lively, diverse, neighborly and safe. Broadview is a perfect place to raise a family or open a business. If you have any questions about our community, please feel free to explore this website or reach out to us at kthompson@broadview-il.gov. Katrina Thompson was elected the sixth Mayor in the Village of Broadview on April 4, 2017. She is the first African-American woman to hold the office. Mayor Thompson is dedicated to promoting a vibrant local economy, strong neighborhoods, a high quality of life, a thriving business community, and a greener Broadview. She believes Broadview’s strength comes from being a balance community and the diversity of its people. Prior to becoming Mayor she served as Executive Director of West Humboldt Park Development Council, where she was responsible for strategic planning, communication, fundraising, and organizational management. West Humboldt Park Development Council works collaboratively to develop, implement and sustain processes that improve the quality of life for people, families and businesses in the West Humboldt Park community on the west side of the Chicago. Mayor Thompson was the fourth Executive Director at Broadview Park District in a seven-year period. As the revolving door turned, the families were being denied a true safe haven with recreational opportunities, infringing them on the ability to improve the quality of life. As she worked with the Board of Directors to establish a management and organizational structure with a clear governance protocol, steward important fundraising relationships, build strong corporate and community partnerships, create a much needed-healthy food initiative, strengthen programs, and balance community need with strategic growth and resources. Mayor Thompson mentor youths between the ages of 14-21 who are going to school in under-resourced communities to fulfill their potential by empowering them to become confident, college-bound, career focused, and ready to join the next generation of professional men and women. 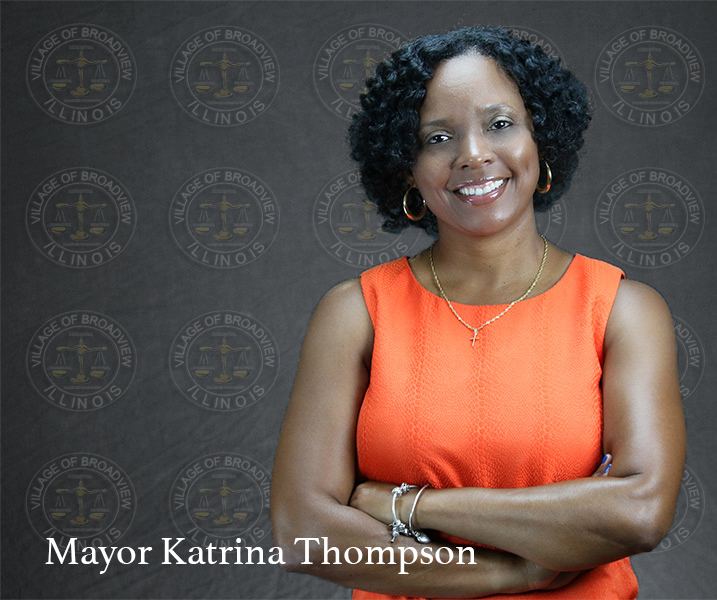 Born in Inglewood, California, Mayor Thompson holds a Master’s degree from Roosevelt University and a Bachelor’s degree from Concordia University. She enjoys reading and playing golf. She has received numerous commendations for her community involvement. In 2017 Mayor Thompson received the Chicago Defender Women of Excellence Award. She has one daughter, who attends Prairieview A&M University in the State of Texas.